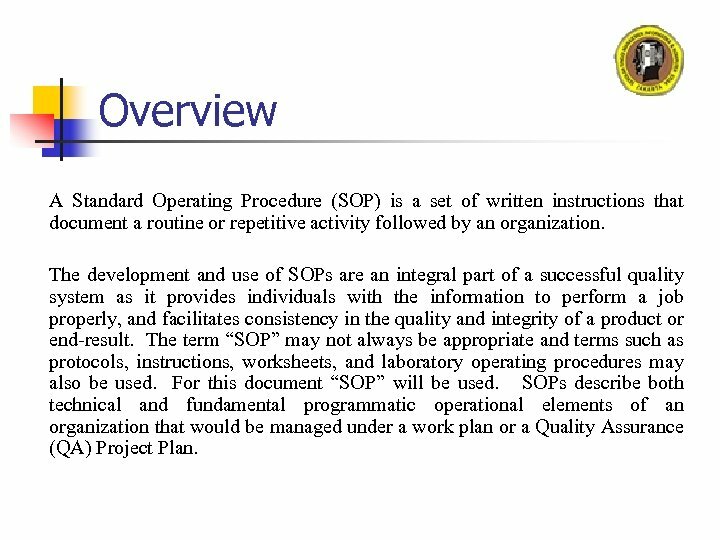 Overview A Standard Operating Procedure (SOP) is a set of written instructions that document a routine or repetitive activity followed by an organization. 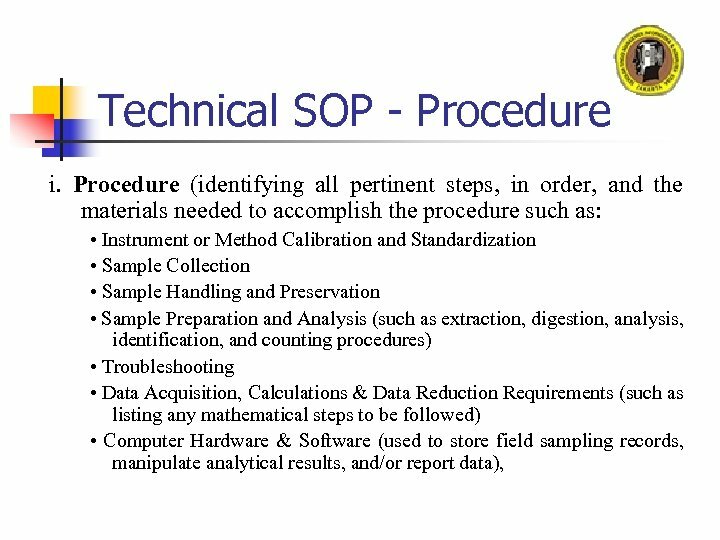 The development and use of SOPs are an integral part of a successful quality system as it provides individuals with the information to perform a job properly, and facilitates consistency in the quality and integrity of a product or end-result. 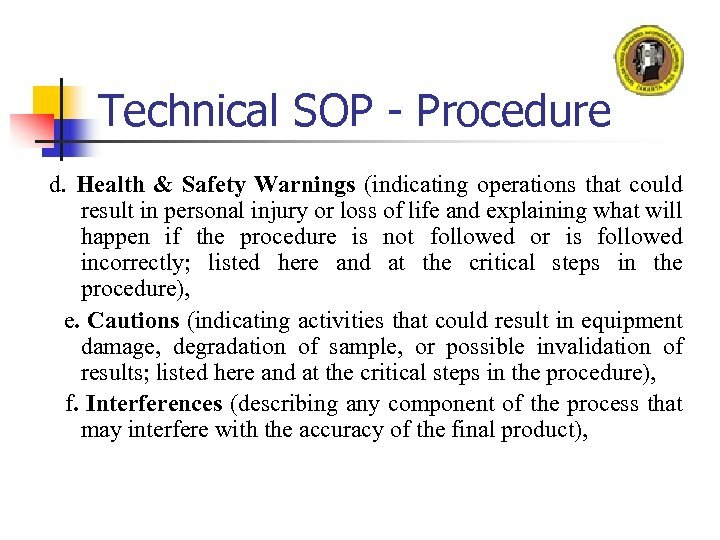 The term “SOP” may not always be appropriate and terms such as protocols, instructions, worksheets, and laboratory operating procedures may also be used. 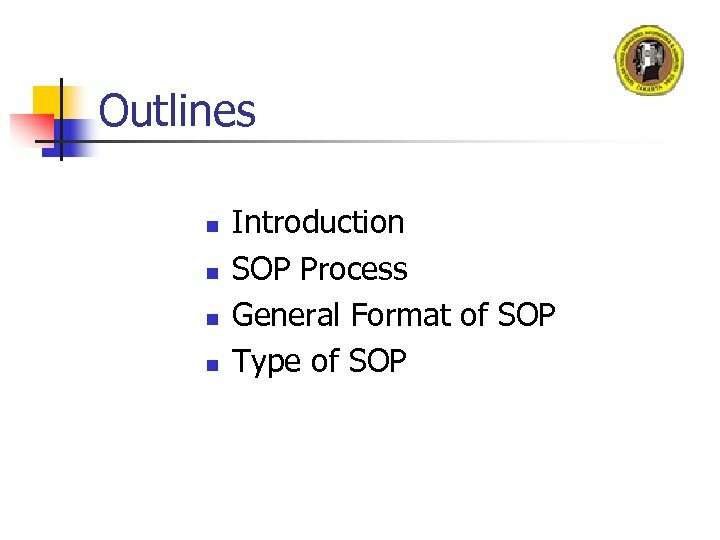 For this document “SOP” will be used. 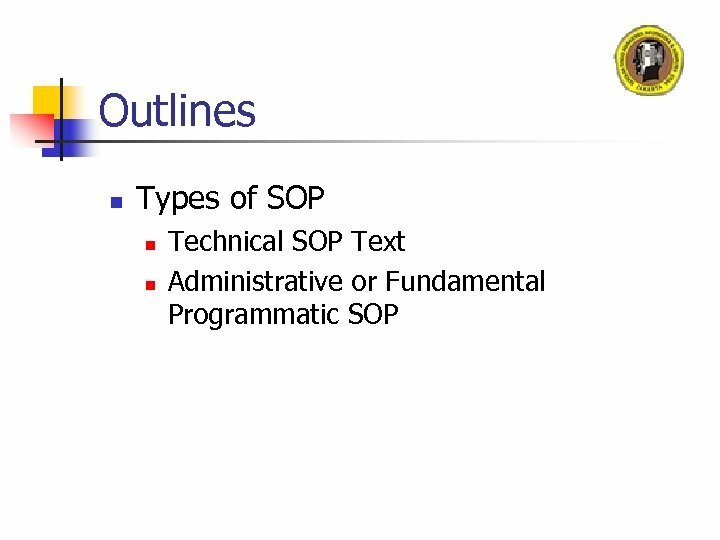 SOPs describe both technical and fundamental programmatic operational elements of an organization that would be managed under a work plan or a Quality Assurance (QA) Project Plan. Purpose SOPs detail the regularly recurring work processes that are to be conducted or followed within an organization. They document the way activities are to be performed to facilitate consistent conformance to technical and quality system requirements and to support data quality. They may describe, for example, fundamental programmatic actions and technical actions such as analytical processes, and processes for maintaining, calibrating, and using equipment. 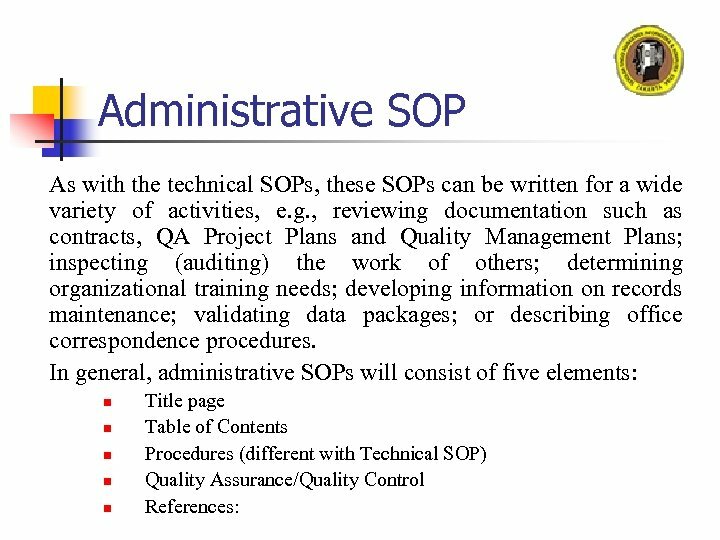 SOPs are intended to be specific to the organization or facility whose activities are described and assist that organization to maintain their quality control and quality assurance processes and ensure compliance with governmental regulations. 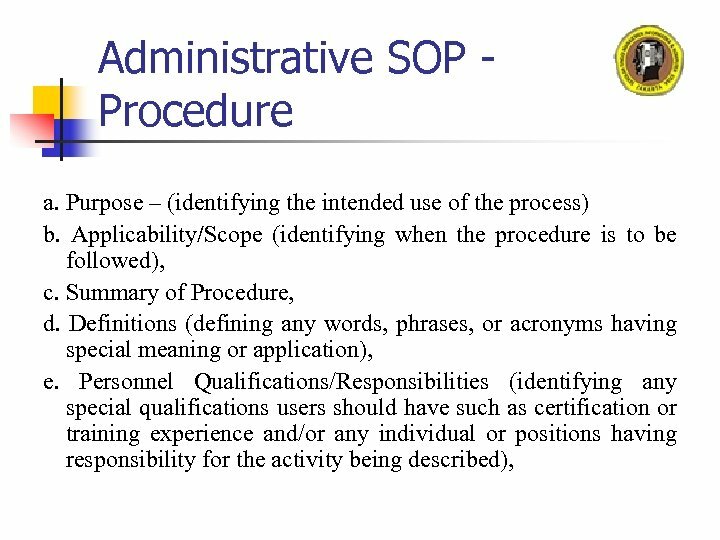 Purpose If not written correctly, SOPs are of limited value. In addition, the best written SOPs will fail if they are not followed. Therefore, the use of SOPs needs to be reviewed and re-enforced by management, preferably the direct supervisor. Current copies of the SOPs also need to be readily accessible for reference in the work areas of those individuals actually performing the activity, either in hard copy or electronic format, otherwise SOPs serve little purpose. Benefits The development and use of SOPs minimizes variation and promotes quality through consistent implementation of a process or procedure within the organization, even if there are temporary or permanent personnel changes. SOPs can indicate compliance with organizational and governmental requirements and can be used as a part of a personnel training program, since they should provide detailed work instructions. Benefits It minimizes opportunities for miscommunication and can address safety concerns. 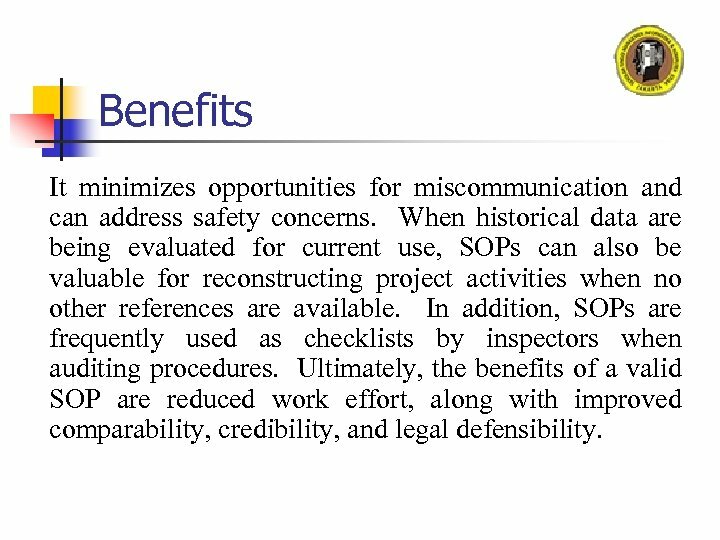 When historical data are being evaluated for current use, SOPs can also be valuable for reconstructing project activities when no other references are available. 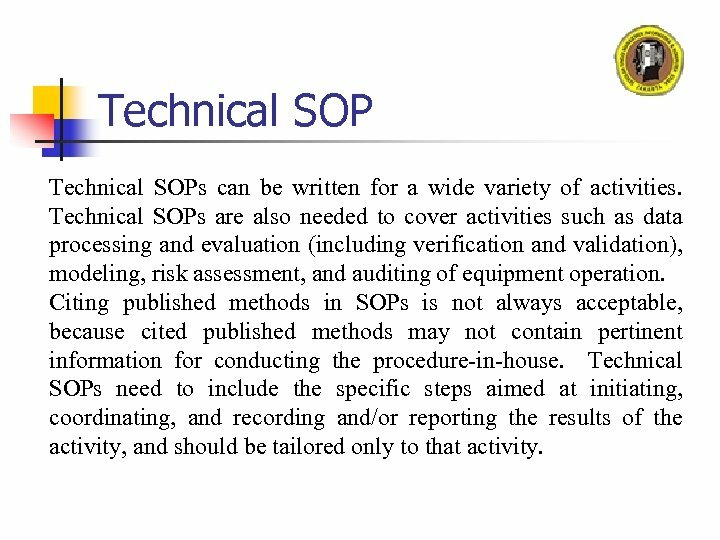 In addition, SOPs are frequently used as checklists by inspectors when auditing procedures. Ultimately, the benefits of a valid SOP are reduced work effort, along with improved comparability, credibility, and legal defensibility. 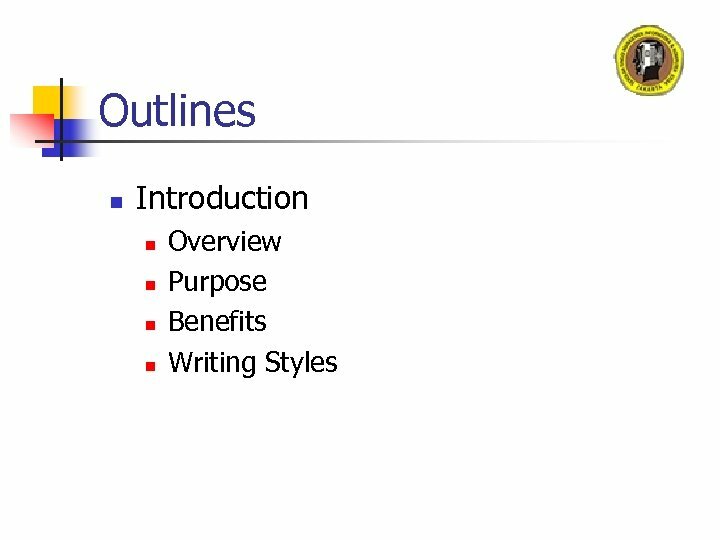 Writing Styles SOPs should be written in a concise, step-by-step, easy-to-read format. The information presented should be unambiguous and not overly complicated. The active voice and present verb tense should be used. The term "you" should not be used, but implied. The document should not be wordy, redundant, or overly lengthy. Keep it simple and short. Information should be conveyed clearly and explicitly to remove any doubt as to what is required. Also, use a flow chart to illustrate the process being described. 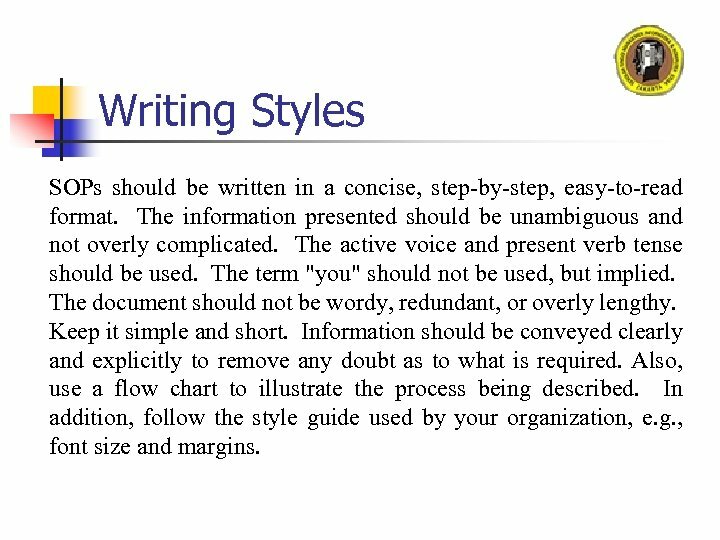 In addition, follow the style guide used by your organization, e. g. , font size and margins. Preparation The organization should have a procedure in place for determining what procedures or processes need to be documented. Those SOPs should then be written by individuals knowledgeable with the activity and the organization's internal structure. These individuals are essentially subject-matter experts who actually perform the work or use the process. A team approach can be followed, especially for multi-tasked processes where the experiences of a number of individuals are critical, which also promotes “buy-in” from potential users of the SOP. Preparation SOPs should be written with sufficient detail so that someone with limited experience with or knowledge of the procedure, but with a basic understanding, can successfully reproduce the procedure when unsupervised. The experience requirement for performing an activity should be noted in the section on personnel qualifications. For example, if a basic chemistry or biological course experience or additional training is required that requirement should be indicated. Review and Approval SOPs should be reviewed (that is, validated) by one or more individuals with appropriate training and experience with the process. It is especially helpful if draft SOPs are actually tested by individuals other than the original writer before the SOPs are finalized. 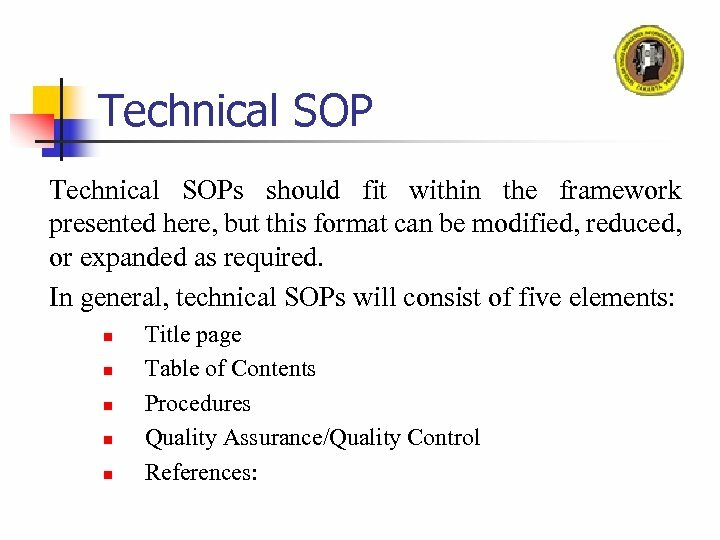 The finalized SOPs should be approved as described in the organization’s Quality Management Plan or its own SOP for preparation of SOPs. Generally the immediate supervisor, such as a section or branch chief, and the organization’s quality assurance officer review and approve each SOP. Signature approval indicates that an SOP has been both reviewed and approved by management. 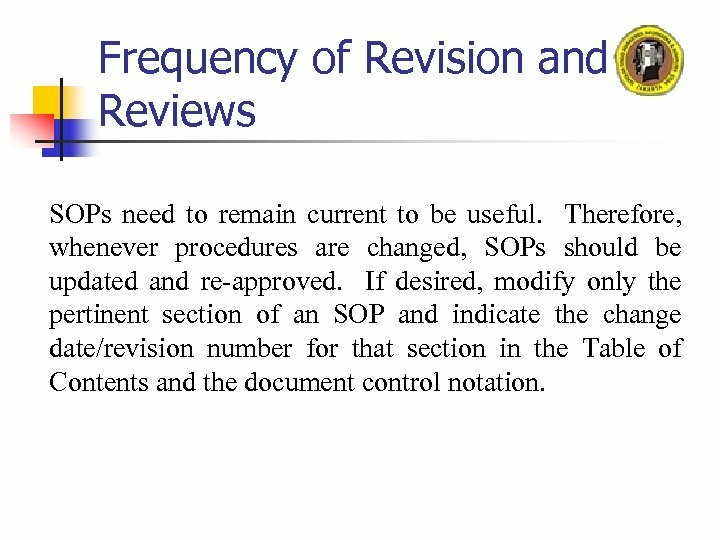 Frequency of Revision and Reviews SOPs need to remain current to be useful. Therefore, whenever procedures are changed, SOPs should be updated and re-approved. If desired, modify only the pertinent section of an SOP and indicate the change date/revision number for that section in the Table of Contents and the document control notation. 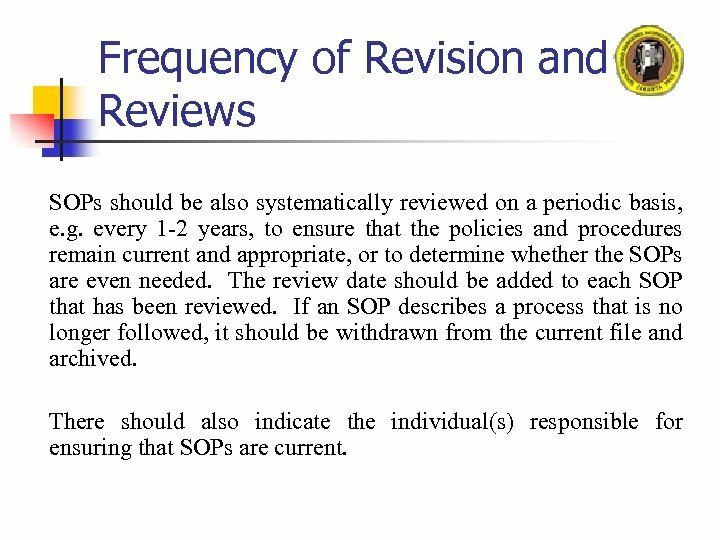 Frequency of Revision and Reviews SOPs should be also systematically reviewed on a periodic basis, e. g. every 1 -2 years, to ensure that the policies and procedures remain current and appropriate, or to determine whether the SOPs are even needed. 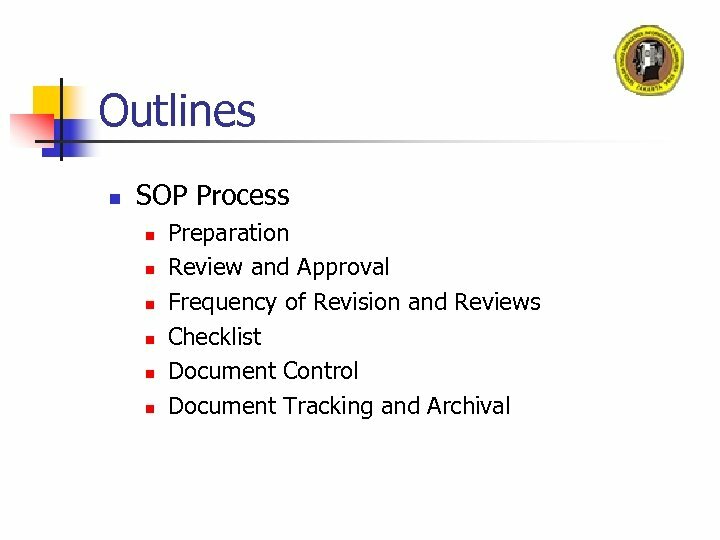 The review date should be added to each SOP that has been reviewed. If an SOP describes a process that is no longer followed, it should be withdrawn from the current file and archived. There should also indicate the individual(s) responsible for ensuring that SOPs are current. Checklist Many activities use checklists to ensure that steps are followed in order. Checklists are also used to document completed actions. Any checklists or forms included as part of an activity should be referenced at the points in the procedure where they are to be used and then attached to the SOP. In some cases, detailed checklists are prepared specifically for a given activity. 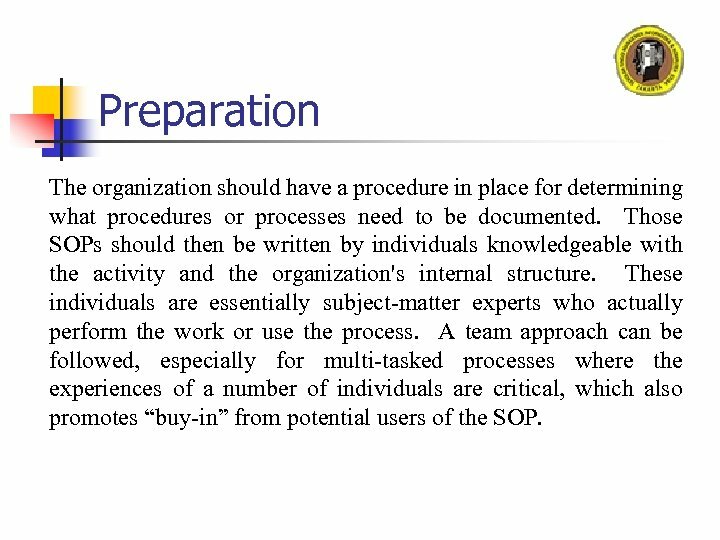 In those cases, the SOP should describe, at least generally, how the checklist is to be prepared, or on what it is to be based. 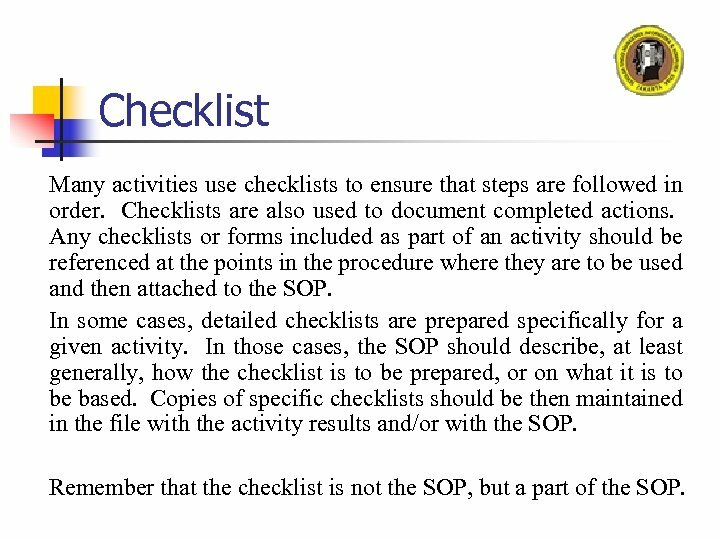 Copies of specific checklists should be then maintained in the file with the activity results and/or with the SOP. Remember that the checklist is not the SOP, but a part of the SOP. Document Control Each organization should develop a numbering system to systematically identify and label their SOPs, and the document control should be described in its Quality Management Plan. 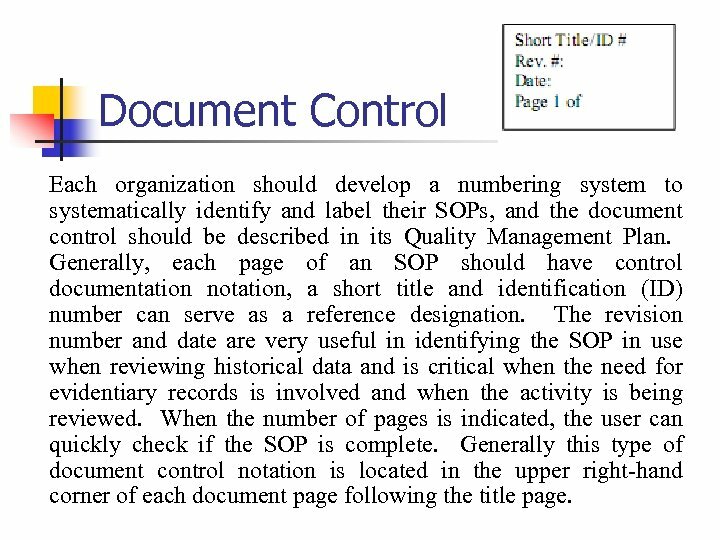 Generally, each page of an SOP should have control documentation notation, a short title and identification (ID) number can serve as a reference designation. The revision number and date are very useful in identifying the SOP in use when reviewing historical data and is critical when the need for evidentiary records is involved and when the activity is being reviewed. 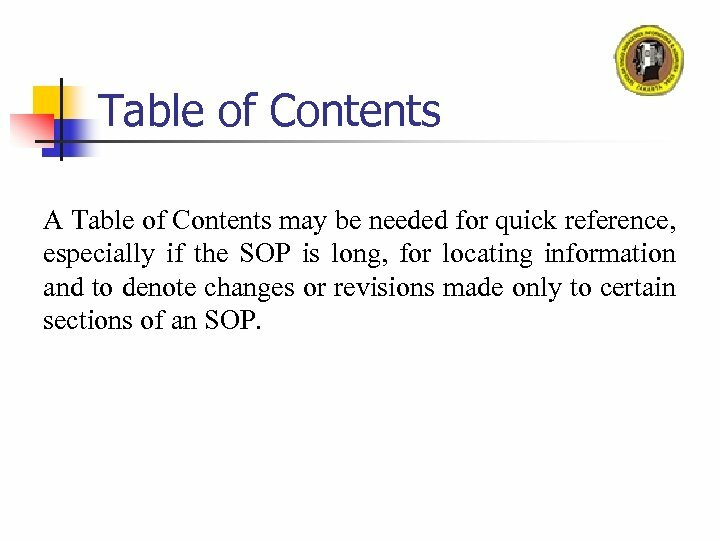 When the number of pages is indicated, the user can quickly check if the SOP is complete. Generally this type of document control notation is located in the upper right-hand corner of each document page following the title page. 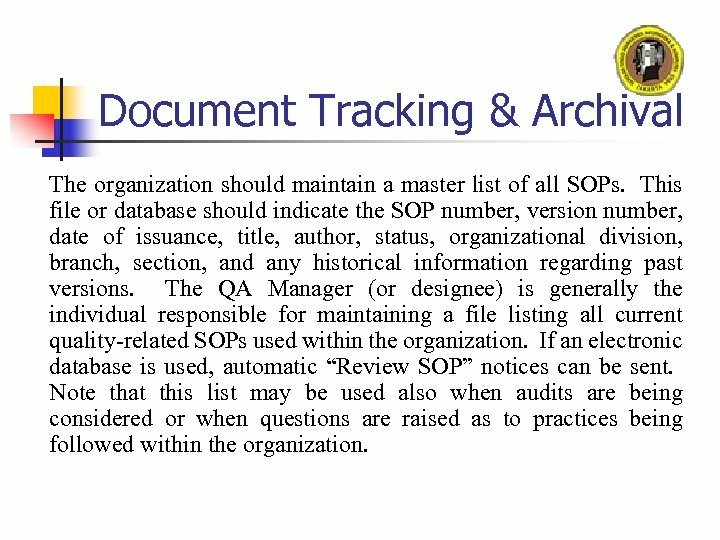 Document Tracking & Archival The organization should maintain a master list of all SOPs. This file or database should indicate the SOP number, version number, date of issuance, title, author, status, organizational division, branch, section, and any historical information regarding past versions. The QA Manager (or designee) is generally the individual responsible for maintaining a file listing all current quality-related SOPs used within the organization. If an electronic database is used, automatic “Review SOP” notices can be sent. Note that this list may be used also when audits are being considered or when questions are raised as to practices being followed within the organization. General Formats SOPs should be organized to ensure ease and efficiency in use and to be specific to the organization which develops it. There is no one “correct” format; and internal formatting will vary with each organization and with the type of SOP being written. Where possible break the information into a series of logical steps to avoid a long list. The level of detail provided in the SOP may differ based on, e. g. , whether the process is critical, the frequency of that procedure being followed, the number of people who will use the SOP, and where training is not routinely available. . 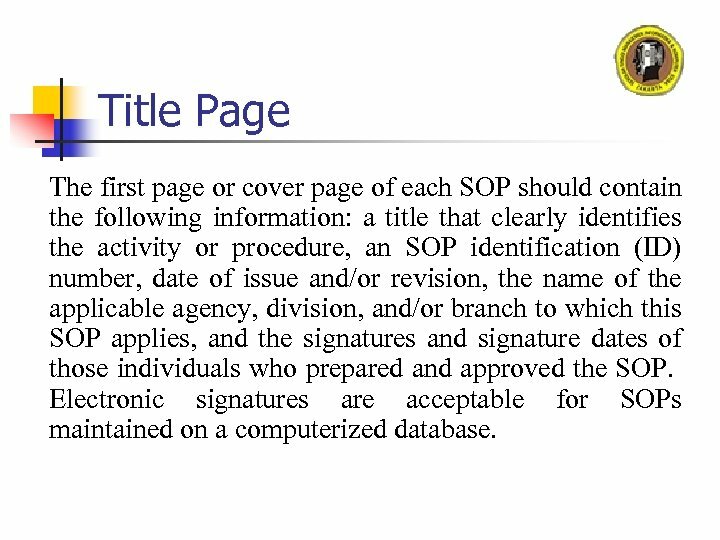 Title Page The first page or cover page of each SOP should contain the following information: a title that clearly identifies the activity or procedure, an SOP identification (ID) number, date of issue and/or revision, the name of the applicable agency, division, and/or branch to which this SOP applies, and the signatures and signature dates of those individuals who prepared and approved the SOP. Electronic signatures are acceptable for SOPs maintained on a computerized database. 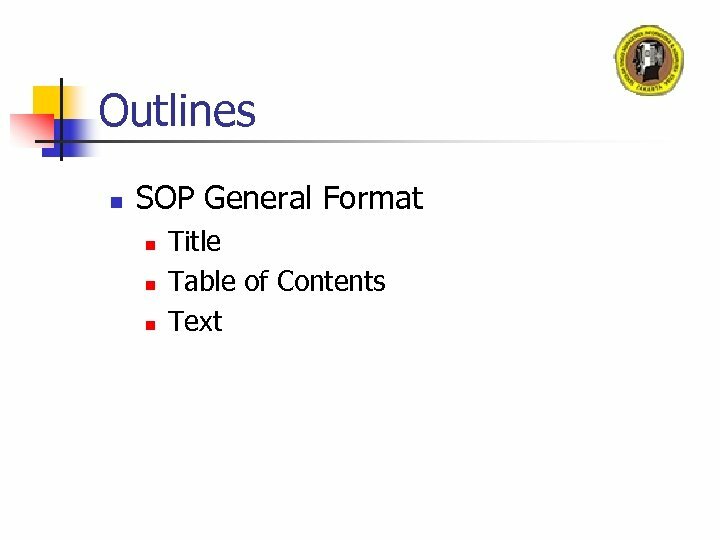 Table of Contents A Table of Contents may be needed for quick reference, especially if the SOP is long, for locating information and to denote changes or revisions made only to certain sections of an SOP. 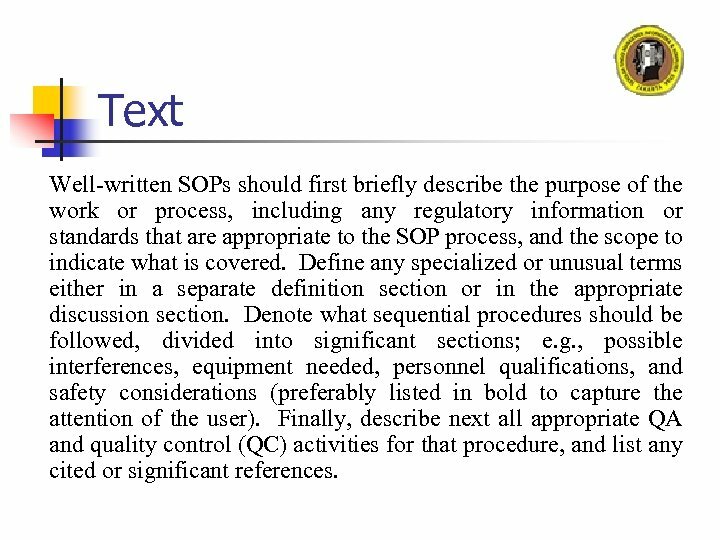 Text Well-written SOPs should first briefly describe the purpose of the work or process, including any regulatory information or standards that are appropriate to the SOP process, and the scope to indicate what is covered. Define any specialized or unusual terms either in a separate definition section or in the appropriate discussion section. Denote what sequential procedures should be followed, divided into significant sections; e. g. , possible interferences, equipment needed, personnel qualifications, and safety considerations (preferably listed in bold to capture the attention of the user). Finally, describe next all appropriate QA and quality control (QC) activities for that procedure, and list any cited or significant references. Technical SOPs can be written for a wide variety of activities. Technical SOPs are also needed to cover activities such as data processing and evaluation (including verification and validation), modeling, risk assessment, and auditing of equipment operation. Citing published methods in SOPs is not always acceptable, because cited published methods may not contain pertinent information for conducting the procedure-in-house. Technical SOPs need to include the specific steps aimed at initiating, coordinating, and recording and/or reporting the results of the activity, and should be tailored only to that activity. 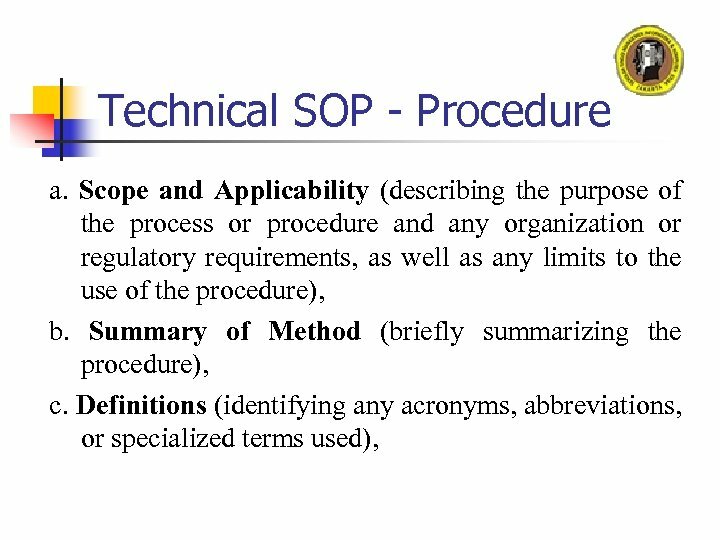 Technical SOP - Procedure j. Data and Records Management (e. g. , identifying any calculations to be performed, forms to be used, reports to be written, and data and record storage information). Quality Control & Assurance QC activities are designed to allow self-verification of the quality and consistency of the work. 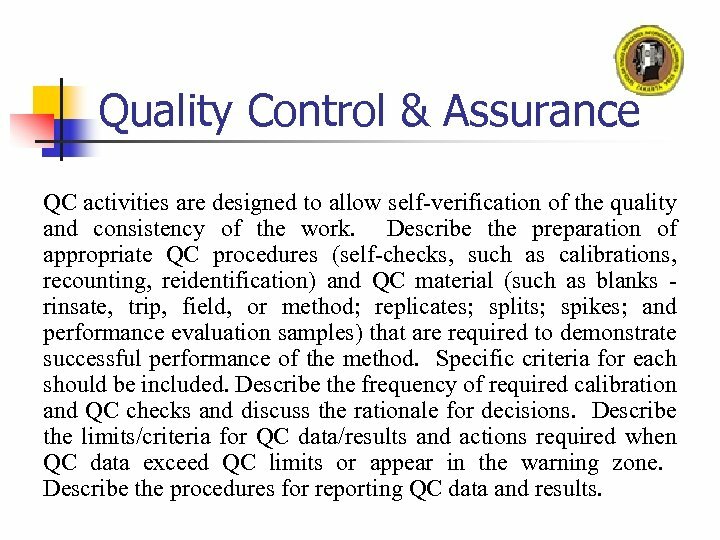 Describe the preparation of appropriate QC procedures (self-checks, such as calibrations, recounting, reidentification) and QC material (such as blanks rinsate, trip, field, or method; replicates; splits; spikes; and performance evaluation samples) that are required to demonstrate successful performance of the method. Specific criteria for each should be included. Describe the frequency of required calibration and QC checks and discuss the rationale for decisions. Describe the limits/criteria for QC data/results and actions required when QC data exceed QC limits or appear in the warning zone. Describe the procedures for reporting QC data and results. 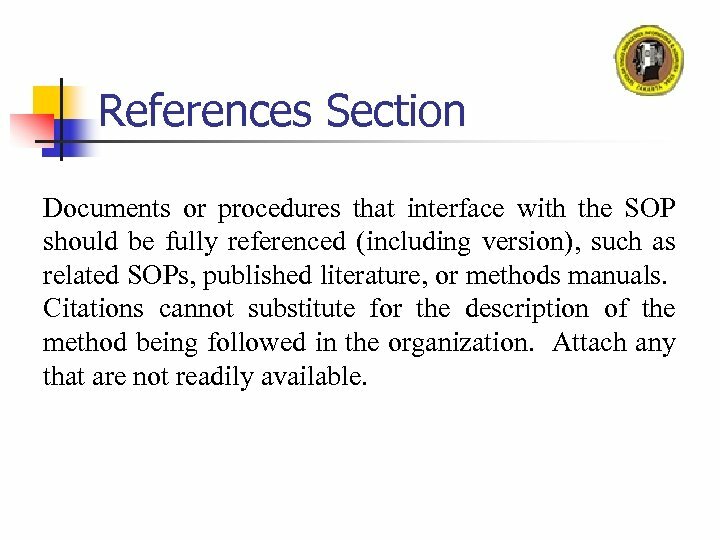 References Section Documents or procedures that interface with the SOP should be fully referenced (including version), such as related SOPs, published literature, or methods manuals. Citations cannot substitute for the description of the method being followed in the organization. Attach any that are not readily available. 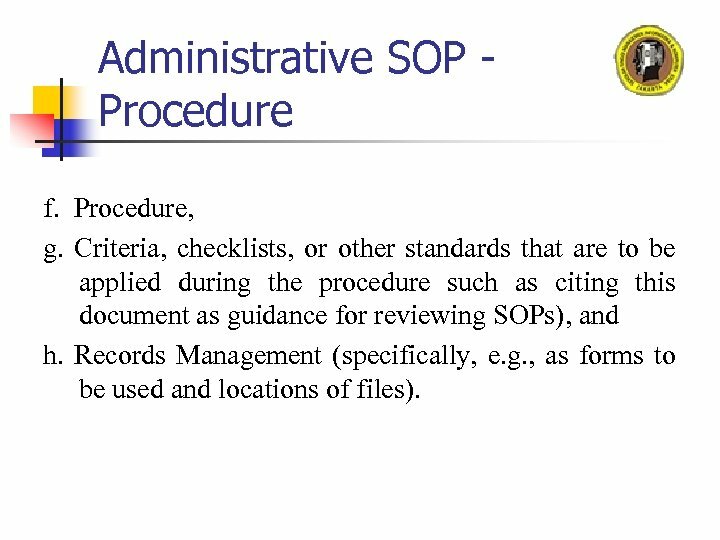 Administrative SOP Procedure f. Procedure, g. Criteria, checklists, or other standards that are to be applied during the procedure such as citing this document as guidance for reviewing SOPs), and h. Records Management (specifically, e. g. , as forms to be used and locations of files). References Merci a tous …. . ! 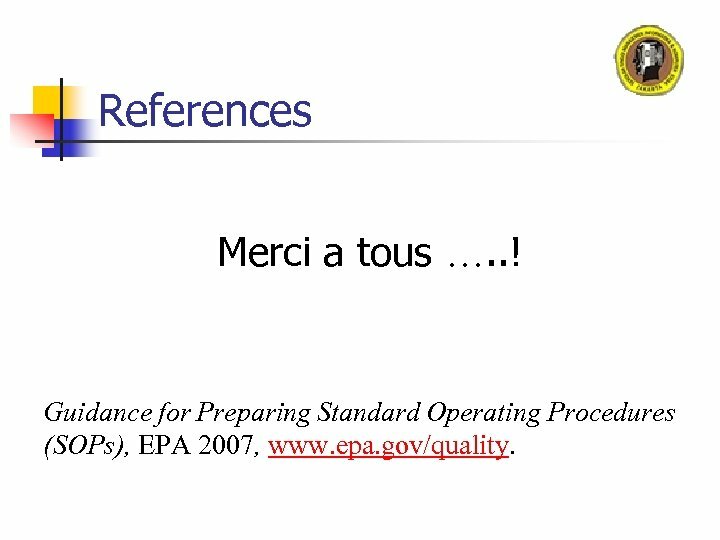 Guidance for Preparing Standard Operating Procedures (SOPs), EPA 2007, www. epa. gov/quality.